"I bought a SBE3 about a month ago. 1st time I took it out seemed to fringe hit the ducks. Finally had to shoot at a cripple on the water. He was about 40 yrds out. Shot at him a couple of times & couldn't see where the BB's are hitting... Took it to a pattern board & it was shooting way high. I have shot all kinds of shotguns & several benelli's... I was using a 34X34 in piece of paper with a 3in bullseye. At a measured 35 yrds half of the pattern was at the top of the paper the other half over the paper. I tried different chokes etc. Called Benelli, they said they are made to shoot like that.To make a long story short sent it back & they said gun is fine, within their parameters." SBE3 owner D: "Then SBE III had just come out. The design selling points seemed to address the latter design annoyances. I bought an SBE iii with high hopes... and decided to check the POI and pattern of my SBE III. I can report that my results are the same as others report. I shot from a bench rest with no wind or into a head wind. the 3 shot pattern averages POI are 100/0, 12" high and 3" left at 21 yards with full choke and 1oz of 6s. POI with Brenneke slugs at 30 yards results are 15" high and 2" left and a 2" group. 00 buck also printed 15" high and 2" left. The results reveal a missed/wounded deer, a missed turkey, missed/wounded small game, or a missed threat. I conclude that my SBE III is precise and pathetic. I have zero confidence with SBE III "scatter gun" in the field, at the range, or in my home. I have pictures of my results and have sent the images to Benelli with request for an RMA." SBE3 Owner F: "I happen to have bought one of these guns when they came out and it shoots so high it is worthless. I love everything else they did and the things they did change were desperately needed. I also have a brand new SBE II waterfowl edition and it shoots spot on. I am going to send it back to Benelli. Do you have any advise for me when describing my problem and yes I did change the shims and still have to aim way under 23 yard targets to get a clean break. I just don't understand how they could flub this so badly." What is going on? 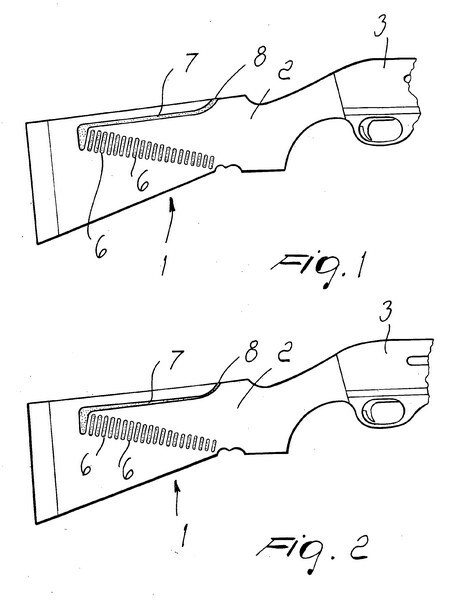 Well, the Benelli patent published on October 1, 2003 offers the explanation. Inventor Luciano Burigana had the collapsing gap in his “stock for firearms” which later was sold as the “Comfortech” stock. 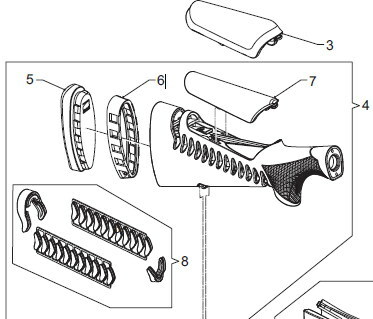 The images from the patent tell the story. The SBE3 stock has far more flex than previous Comfortech attempts and is more comfortable to shoot as a result. I can readily feel the difference with 1-1/8 oz. target loads. The unintended consequence of this is not taking the extra flex and more rapid stock gap collapse into consideration when machining the receiver. As a result of the close to instant collapse of the stock gap, the patterns throw excessively high, over the heads of turkeys, potentially crippling ducks with only the lowermost portion of the pattern, and so forth. The Benelli Nova Comfortech stock, above, has far less flex, does little for recoil attenuation, but also does not create nasty point of impact issues, either. Many shotguns don't shoot to point of aim, to be sure. I actually prefer a hunting shotgun that throws slightly high. The “60/40” pattern that some like to talk about is only putting the center of the pattern three inches high at 40 yards. 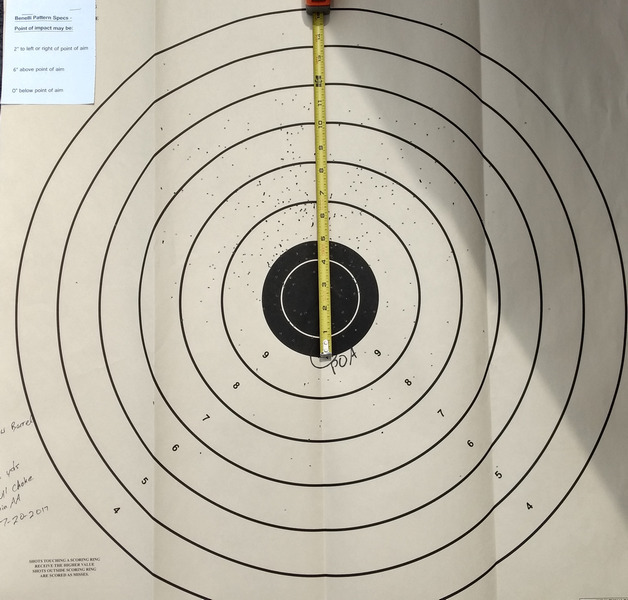 A 100 / 0 pattern is not an acceptable wingshooting pattern, as that is fifteen inches high at 40 yards. As shooters are tragically finding out, the radically skeletonized buttstock of the Benelli SBE3 is a jellyfish, essentially guaranteeing not only an excessively high point of impact, but an inconsistent point of impact as well, ever-changing in concert with load intensity. Reportedly Benelli's "official specs" are 0 - 6 inches high at 21 yards, within 4 inches of the bull horizontally, also at 21 yards. You can call that type of attempt at a tolerance what you wish: I just have to call it a nasty mess. 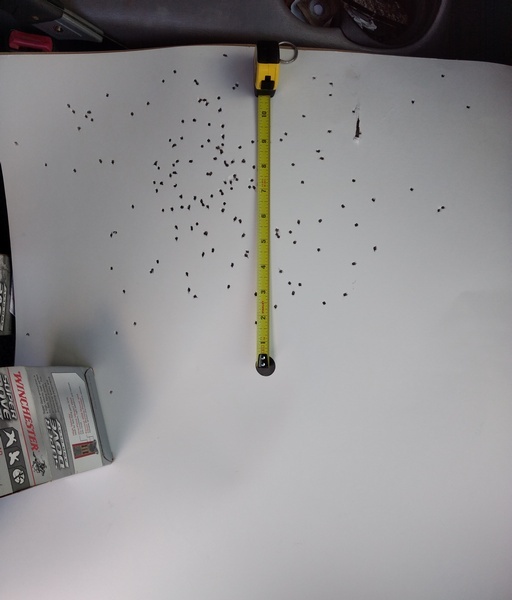 Above, a Benelli SBE3 test pattern from Benelli USA, 21 yards / Full Choke / Winchester AA ammo, after a failed repair attempt including a new barrel. 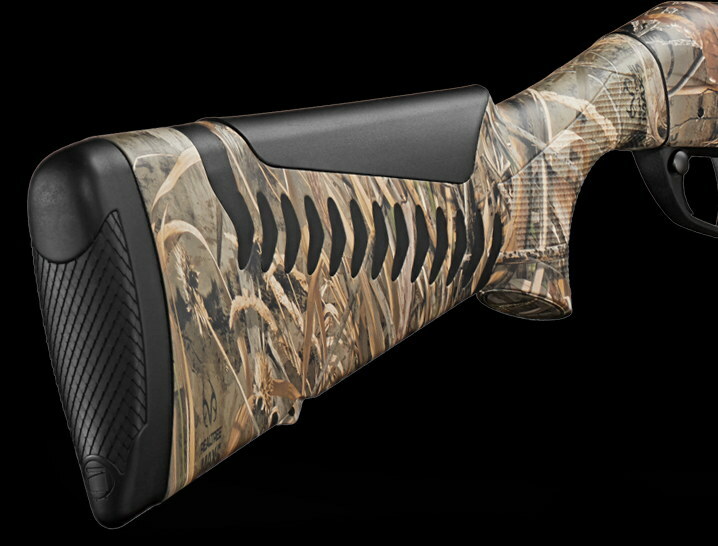 This is, according to Benelli USA, "shooting within spec." It is a level playing field here. Unless otherwise claimed, shotguns should shoot approximately to point of aim at 40 yards. Dedicated trap guns most often shoot 60/40 to 70/30, meaning about about 3 inches to 6 inches high at 40 yards. If my Fabarm L4S Grey Hunter threw more than three inches high at 40 yards, it would be defective. It doesn't. If my Remington V3's, Browning B-80's, Benelli M2's, Browning Automatic-Fives, Mossberg SA-20, 870 Wingmasters, Browning Cynergy's, Beretta A303's, or any of the five Browning Maxus models tested threw significantly more than three inches or so high at 40 yards, they would also be defective. They do not. Any hunting shotgun that blows patterns 8, 10, or 12 inches high at 40 yards is wildly defective, regardless of who made it, who owns it, or where it was made. Randy: Just wanted to thank you for your articles on the super black eagle 3 and it’s defect in shooting high! In early fall I drove a days journey to get to a gun shop that had one in stock. I traded in my SBE 2 and paid about a thousand dollars to boot to get the #3. Now I regret it and wish I could have my old gun back. When I first got it I went trap shooting and did the worst ever in accuracy and the shooting coach there said I was shooting high on them all. I’ve had the worst pheasant season, working hard with my dog to find sparse birds and then missing most, which is unlike me. Explain that to your dog or wife who loves wild game! I’ve patterned the gun several times, always shooting high and a few inches to the left. I did the whole shim adjustments which helped a little, not much. I use the gun also for ducks, geese, and turkey and dread being disappointed there too. My plan now is to call the salesman and see if I can get money back. I’ll probably go back to a SBE 2 even though I liked a lot of features of the 3 such as lighter weight, no Benelli click, less recoil etc. Any other suggestions? Randy, I was sent your article from October on Benelli's design flaw. A very interesting read. I have been a long time Benelli fan and have ran thousands and thousands of loads through my shotguns. Upon purchasing 3 brand new Super Black Eagle 3 ( for myself, wife and son) we went right to dove hunting. None of us could hit the broad side of a barn! We spent the next day patterning them and I was so upset with our results. One pattern was at POI but the other two were very left. After shimming all three guns as best we could with what was supplied, all three guns were still very very high. We have since sold all three guns and just gone back to our original SBE2. It will be interesting to see what Benelli does if anything..... here is the best of our three even after shims. Apparently, now close to a year later, the problems persist and Benelli is doing nothing about it. There is scant little evidence that Benelli cares about their customers or the brand-damaging, loudly defective product they shamelessly take good money for.